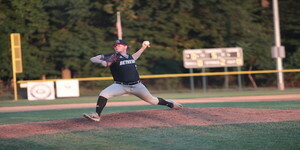 Big Train rallied in the sixth inning in their game against the Gaithersburg Giants to come back and win 7-1. This win puts Big Train with a record of 33 wins and 6 losses, tying the record for most amount of wins in a season. The Giants remain ranked second in the Cal Ripken North division with a record of 20 wins and 19 losses. Both teams remained scoreless until the bottom of the fourth inning when the Giants took the lead with their first and only run of the game. Saul Garza made it onto first base with a walk, advanced to third off a line drive from Sam Bertelson, and Garza stole for home with Ryan Shinn at bat. Garza was the only player from the Giants who was able to put runs on the board. Big Train answered back in the sixth inning, scoring three runs to put them in the lead. AJ Lee (University of Maryland) made it onto first with a groundball towards left field and stole for second with Fox Semones (James Madison University) at bat. Semones made it on first with a groundball towards third base. With Tyler Villaroman (University of San Francisco) batting next, Lee and Semones were able to advance to third and second base, respectively, off a wild pitch from the Giants, and Villaroman made it to first on a walk. With the bases loaded, Carson Taylor (Virginia Tech University) hit a sacrifice fly into center field, allowing Lee to come to score for Bethesda, tying the game at 1-1. Semones and Villaroman came home next to earn Big Train’s next two runs off a groundball hit past third base from Justin Wylie (University of Arizona). This play put Big Train in the lead at 3-1. Big Train continued to score unanswered runs in the ninth inning, earning an additional four runs to win the game 7-1. AJ Lee made it on first with a walk, and Semones also was walked to first, putting Lee on second. Villaroman, batting next, made it on first with a groundball over the pitchers head, loading the bases for Bethesda once again. Lee and Semones came home to score for Bethesda off a groundball hit from Carson Taylor between first and second base. Villaroman came home next for Bethesda off a groundball hit towards second base from Alec Burleson (East Carolina University), putting Taylor on second and Burleson on first. Wylie loaded the bases for Bethesda, walking to first base. Taylor came home to score Bethesda’s final run when Jacob Southern (Jacksonville University) was hit by a pitch with the bases loaded. Head coach Sal Colangelo was excited about this game and what it means for Big Train. “The guys played hard—hats off to them—they went through a heck of a game. They battled; they did the little things…. I’m happy the guys didn’t give up,” Colangelo said after the game. “They fought until the end, and they came out with the victory.” This games shows exactly how hard Big Train can work and how they are a force, no matter what inning in the game. Big Train travels to the Braves home ballpark for the final game of the regular season. First pitch is scheduled for 7 p.m.